What Gravel Do You Use in a Septic Tank Bed? Septic tanks allow homeowners in isolated areas without sewage service to deal with the wastewater produced by their households. The tank requires a bed of well-draining material below it to control how quickly water runs out of it. Choosing the gravel ensures your yard doesn't become muddy and wet with sewage. 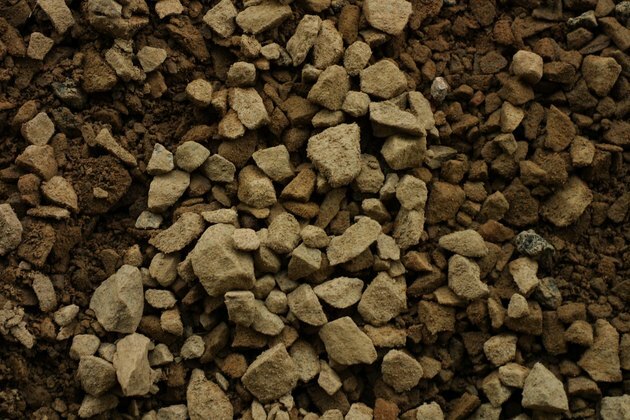 Gravel consists of small chunks of rock. Using the right sized gravel prevents water from flowing too slowly or quickly out of the septic tank. Gravel that is too small causes the tank to fill up with water and can cause a backup in the house, while oversized gravel allows water to flood the soil around the tank and your yard. Pieces of clean, washed rock broken into pieces about one and half inches in diameter work best, according to the Eco-Nomic website. Gravel suppliers refer to it as drain rock. Not all gravel comes from the same type of crushed rock. Softer stone like sandstone and shale are used for driveways and decorative purposes, but they won't work for a septic tank bed. The bed must be strong enough to hold the weight of a septic tank full of waste and water without compressing or crushing. Granite gravel is strong enough to support the tank, making it perfect for use in septic systems, according to Maloney's Landscape Supplies. The amount of gravel needed depends on the size of the septic tank and the soil composition. A septic tank sized for a two-bedroom house will need a bed with at least 200 square feet of gravel for installation in sandy soil with coarse particles, says Eco-Nomic, but when installed in a clay- or loam-based soil, the bed needs to be 1,200 square feet or more. The size of the bed is measured by the surface area, and all beds use a uniform thickness of 1 foot. Gravel isn't the only drainage material that works for building a septic tank bed. Sand and crushed materials -- including recycled tires, concrete chunks of the correct size and broken glass -- all work in some situations, according to the National Environmental Service Center. As long as the material won't break down in water, allows for drainage and supports the tank, it will work. Some septic systems don't require a bed because a preformed vault handles the entire drainage process. What Can You Use in a Septic System to Unclog the Leaching Bed?